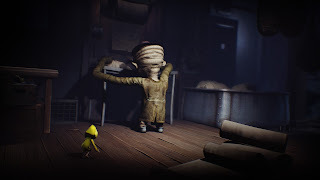 After a few weeks after release I finally have some time to put into Little Nightmares, a Horror Puzzle-Platformer developed by Tarsier Studios (LittleBigPlanet 3, Tearaway Unfolded) and published by Bandai Namco Entertainment. It was released for PC, Xbox One, and PlayStation 4. Note: There are some spoilers. You're thrown into the game with no introduction. You wake up on a suitcase in a dark room and you know for sure that you have to get out. As you venture out you can't help but feel something is there. The eerie atmosphere leaves you on the edge of your seat wondering if this is when something comes after you. Little Nightmares itself is incredibly vague which leaves you to search for answers. Where are you? How did you get here? What is the purpose of this place? Most importantly; Who are you? These questions are what will drive you to finish the game, which isn't too long. Unfortunately, you never really find these things out. You do find out that your name is Six and you're aboard the Maw, an underwater ship. As you progress you encounter some macabre sights. Such as the hanged corpse of a man and numerous caged children. You never really feel safe. Venturing through different sections of the Maw, like the children's quarters, a kitchen, etc. The game itself isn't as much scary as it is tense. When involved in a chase you barely make it out which got me to tense up almost every time. You don't seem to get punished much in this game as you'd imagine. Every puzzle is pretty simplistic but should you make a mistake whether it be doing a puzzle, a chase, or anything for that matter; you'll usually get it the second or third try. You're able to push and pull things to navigate in the Maw. Like using chairs to open doors, using a rope to jump to the next platform, or throw one of those toy monkeys with the cymbals at a button which opens a elevator. The gameplay flows very well and it never feels off beat. Throughout all of the danger, there is a sliver of hope that never escapes. Even after Six is captured by the Janitor, one of the inhabitants of the Maw who is blind with long, lanky arms. You escape from the cage he put you in and he is in patrol of the surrounding areas. Using his strong sense of smell and hearing. To escape from him you must sneak by him, solving puzzles. Avoiding the wooden floors in fear of alerting him with the creaks of your footsteps. Other enemies you encounter are the Chef twins. 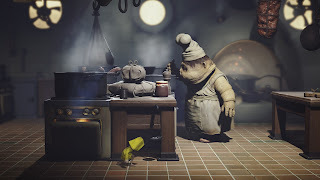 Giant grotesque monsters that are cooking tons of food. Much like the Janitor, you must sneak past the twins unless you want to be part of the meal. The plus side is their arms aren't like Janitor's so its easier to run away and hide from them. These parts are the best and some of the most thrilling parts in a game for me in awhile. Comparing Six to them you're like an ant and it feels like you won't ever escape. Whenever you get through a chase sequence you'll sigh with relief. Outside of these interactions though you spend your time finding keys and navigating to the next section ahead. You get to a point in the game where you get outside and you see obese people coming into the Maw. As you get closer to the end you have to escape from a bunch of these gluttonous people as they try to eat you. The next area is like a Captain's quarters. The Woman you see a few times throughout the game is there brushing her hair and humming looking in the mirror. Even though all of the mirrors are broken and she's wearing a geisha mask. As you navigate past her you find the only non-broken mirror locked away in a room. You take it and you knock her down with it, as it seems that looking at herself is her only weakness. Once Six approaches her; her hunger grows again. Six devours the woman and takes her power for herself. Once Six leaves the room and walks through the dining hall, she kills all of the people in her path. She emerges from the Maw and in the distance, you hear the siren of an approaching boat. 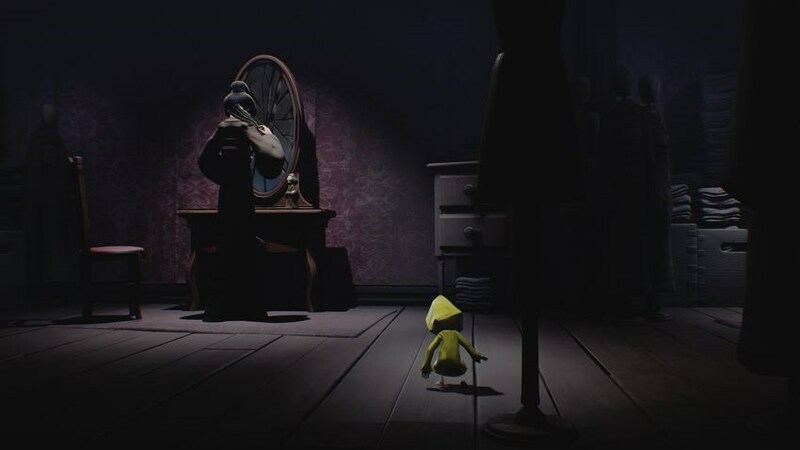 Little Nightmares is an exhilarating title. Even though it should take at most 3 hours to beat; it comes out as one of my favorite games so far this year. A main issue I have is it never truly gives you answers. I want to know more about Six, The Woman, The Maw, everything. The ending was quite sudden and didn't make 100% sense. I'm quite invested in this world now and how everything came to be. Apparently they are making a prequel comic so I'm very excited to get some answers (I better get some answers). 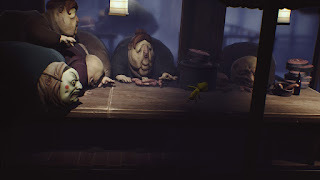 Tarsier did a fantastic job at making a game that enthralls you in the adventure and I'm looking forward to their next release. Rob's Top Video Game Composers!